The Survivors . . . question is . . . did they? Well you're reading the liner notes of this damn record so at least there's vinyl testament to their existence . . . and within these grooves also lies proof of their endurance because this is the Survivors as they were . . . live, loud, (slightly distortedl) . . . and great ! 'Yeah, yeah, 'you might argue.' But it's just a hokey band doing a bunch of covers.' Correct, but if you've got the gall to turn up at some party, wack this record on at top db's and let the world dissolve around you, then you'll be closer to the idea of the band, the times they lived in and what it was all about. . .
Brisbane 1976, ten years less enlightened than it is today . . .
feeling the outermost ripples of the great new force sweeping the planet. Rock'n'Roll was re-establishing its natural social profile . . . that of the outlaw, the antisocial, the uncompromising degenerate of grannies' dreams. Somewhere in the midst of all these intangible forces that were shaping a new planetary attitude, Jim was meeting Bruce over the sale of a Nice lp (the group, bozo). Unlike their individual tastes in food which were in compatable, they found that their favourite thing in life was the music of the Who, the Yardbirds, the Pretty Things, the Kinks . . . get the picture? Jim had been squeezed a bit by the music biz and was looking for some recreation, Bruce wanted to make drumkits wish they'd stayed on the drawing board and had a good buddy in Greg whose admiration of Pete Townshend was almost indecent. Weekends' entertainment were thus assured, seeing the three blasting the bushland southern suburbs of Bris. with renditions of their fave songs, never thinking that one day these happenings would pass into some cultish folklore . . .
Maybe they didn't even think about gigging . . . well there weren't any gigs anyway, the Saints had effectively established the new energy music as undesirable, even within the hallowed precincts of enlightened tertiary campuses. The 'I wanna get pissed . . . destroy . . . aaargh' attitude polarised � music in Brisbane . . . the underground was being born and the only effective outlet for the music was at parties. The Survivors played their first gig under the name Rat Salad at a Party in Toowong. They played three songs, got really drunk, thought it was great and decided to do it again. The pattern for gigs in Brisbane was being established . . . play a party, hire a hall, watch out for the noise vigilant cops, try and make enough to cover your costs. The Fucken Lettovers, the Humbers, the Poles, the X Men, Razar, the Survivors and others, diffusing their costs with enthusiasm . . . infecting and affecting . . . until the Curry Shop on George St brought every thing into focus on Sunday evenings. When there were no gigs, the Survivors were at practice replicating their faves, still in their own inimitable way, occasionally popping up with something original. They even recorded a single for their. own 'Real' label ("Baby Come Back'/'Mr Record Man").
. 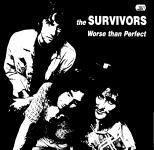 The Survivors were ripped off by Suicide Records, made a couple of trips to Sydney where their own naivety ensured profits for promoters, became something of minor celebrities in their home town; and eventually split up in late '78.
. This band cut a track ("Rescue Me") that's included on the almost totally unbearable 'That's Queensland' compilation of 1980. Bruce and Greg had been busy in '79 with the Credits, who recorded a single ("It's You"/"Fazed Dazed"� for the Rocking Horse Record Shop label. Criticism was often levelled at the Survivors for their lack of original material. The band were able to exist in those punksnobbery times because their energy was equal to anyone's and purely dedicated to the music which transcended the transient social comitments of the time. So, there ya go . . . face the facts . . . you're looking here at something that is unbashedly archival . . . the only truth that holds true here is when the stylus hits the groove . . . and there's only one person who make that happen . . . . . . . go on . .
That these songs ever came to be on vinyl is a miracle of prospecting by GROWN UP WRONG! That they ever came to be recorded is due to the miraculous appearance of DAVE (he knows who he is), at the Rex Hotel gig in Kings Cross, Sydney in 1978, with his pre-walkman technology. That they have been rendered more listenable is due to the mastering skills of LEON ZERVOS at 301. Thanks to Henry Weld for infos on 7" and compilation.